Half Marathon training, your opinion is requested! According to Athlinks, I've run thirteen 10K's, eleven 5K's, four 4 milers, four 8K's, two half marathons and a 5 mile race. There are a couple of other races that Athlinks doesn't list, but for the most part, that's my racing history. 10K is my favorite race distance because it requires both speed and stamina. Unlike 5K's that allow me to go all-out because I know that it will be over inside of 30 minutes, 10K's require a much more strategic approach. 10K, or 6.2 miles is also a friendly distance. Even if I've slacked off on my base training runs (likely), I can generally get through a 10K without much race specific training. In those cases, I don't come close to PR'ing, but I can manage through the distance. Half marathons are a different story. There's something about double digit distance running that requires me to really focus on my training. The toughest run I ever had was my first half marathon. It was so bad, a race volunteer offered to call a doctor as I crossed the line. That experience taught me a lesson about being prepared. I'd thought I'd be okay running my usual 6 miles or so on Sundays, then upping that distance to eight and nine miles the two weekends before the half. It didn't help that I'd also acquired a knee problem at that time, but I blame my poor race performance on my failure to plan. I fared much better the next time. I realized that building a proper base was the key, so I dutifully headed to Bethpage every weekend and ran increasingly longer distances. I ended up improving my time by 15 minutes the second time I ran a half. 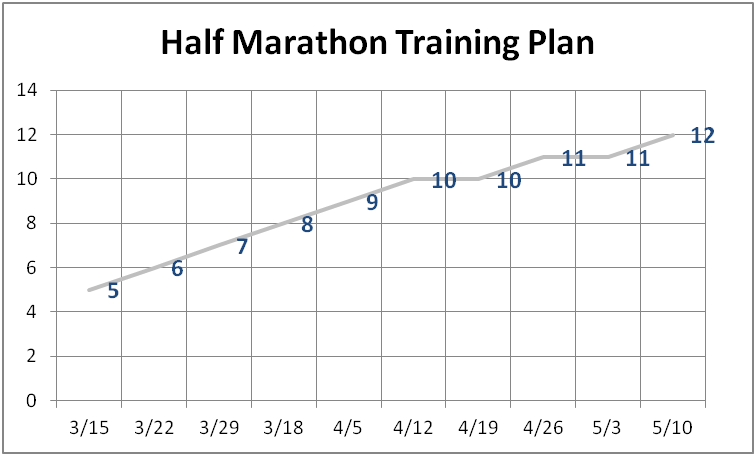 The chart above shows the Sunday long run distance plan I created and followed. 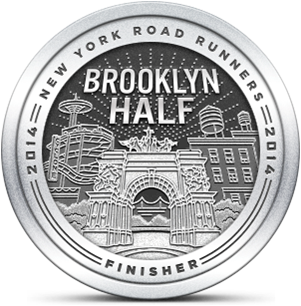 I updated the schedule to coincide with this year's dates leading up to the Brooklyn Half. NYRR's does a good job sending updates about the Brooklyn Half to people who are registered for the race. The last email redirected me to their site where they'd posted three free half marathon training plans. The categories are Conservative, Moderate and Advanced. I'm not apt to follow a plan that prescribes training through the week, but I was interested in the weekly long run distances. I created a second schedule around the Moderate guide to compare it with my current plan (see above). I did well the last time by increasing my long run distance about a mile a week, topping out at 12 miles the weekend before the race. 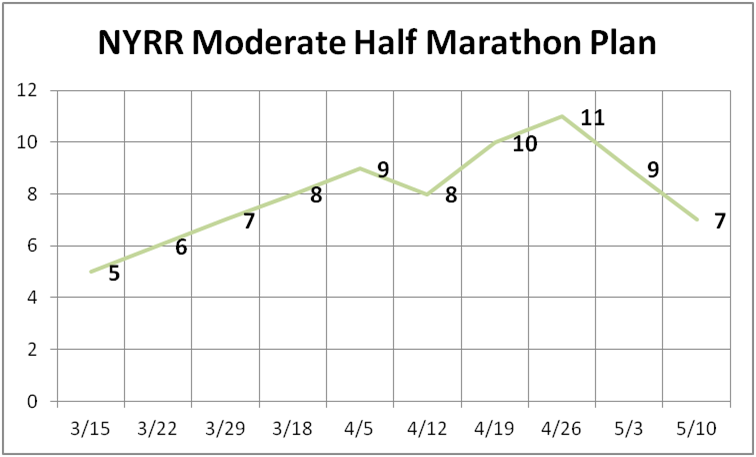 The NYRR plan steps up and down, with a decided taper near the end. I assume NYRR knows a lot more than I do about this stuff, so there must be a reason for reducing the long run distances near the end. I'm reluctant to change from what worked for me last time, but maybe I should consider following the Moderate plan. I will take advice on this, so please share your opinion. i've been running most of my life, but was not a long distance runner for most of it, either. so i was a novice to half marathons a few years ago, too. i'm still no expert. my q is what is your goal? to finish well, in a time you're happy about, or to set an ambitious pr? i'll share what finally got me sub-2 (it took me four years of trying). my first few attempts looked a lot like your plan. i think it's a good one for racing a decent time that you're happy with. 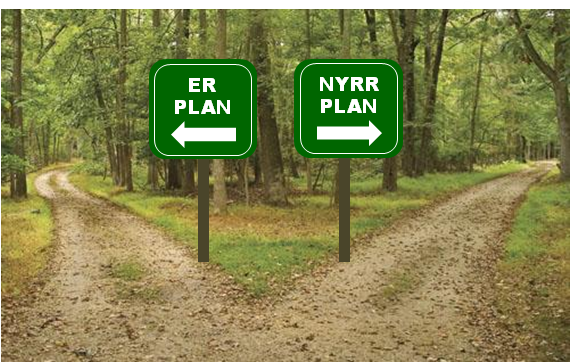 nyrr's looks like it's cribbed from some internet beginner plans (i'm not a fan). that said, i do think a reduction in mileage the week before the race is a good idea. i'd try to do my longest run two weeks out. the key for me ended up being doing at least two 15+ milers. and another 7-10 mile run during the week. plus a 10k, 15k, and 10 mile race, and progression runs in the buildup phase. in effect, more overall mileage. and more of it at hoped-for race pace. Thanks Carla. I think my primary goal is to have a good experience in the race and to feel in control throughout the run. I'd like to break 2:00, so the extended (past 13 mile) training runs might help there as well as the speed work. I can always adjust the program a little as I make my way through. The idea of training on the actual course or simulating the hills is good. Thanks, I like that schedule and I'm glad you're validating it. It will be hard to integrate a long run mid week because of time, but I'll try to figure that out. The speed work is a good idea. I need to maintain the discipline to do that on an ongoing basis. I'm always happy after I do. I don't plan to ever run a full marathon though. I can fill a few posts about my reason why. I can't follow a schedule because of work (although I'd like to,) so I don't have much experience. In this regard I can't recommend anything, or come up with an alternative. I'd like to hear your reasons why you would never run a full. You must have some strategy for long runs for Brooklyn though. What did you for the LI and Diva Half's? Full marathon training requires a time commitment that just doesn't work for me. I also have concerns about strain of running 26.2 miles. Some people are built for that, but 13 - 16 miles seems like enough for me. I shouldn't say never, but I'll say it's highly unlikely that I'll ever run more than 25K. Carla, you have a lot of experience. Do you have a blog we can follow? @ER: i hear ya re marathons. i have no plans to do another one. too much time commitment, and i find them very hard on my body.